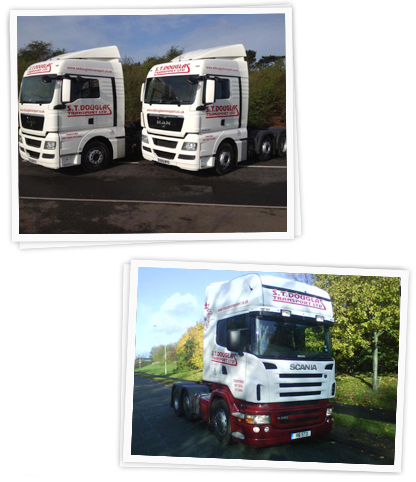 S.T.Douglas Transport Limited has a modern fleet of long distance 44 tonne tractor units. The fleet primarily consists of Scania and Mercedes tractor units which were supplemented in 2012 by two MAN TGX XLX units. All of the units use a 6x2 axle configuration, have high roof sleeper cabs and gross at 44 tonnes. Our trailers are modern 20 – 40ft 14 twistlock sliding skeletal trailers, and can carry two 20ft containers or one 20ft, 30ft, 40ft or 45ft shipping container. We also have 4 metre high x 13.6 metre long pillarless curtain-side trailers. All vehicles are fitted with tracker units which means we can monitor all movements and positions of our vehicles at any time. This gives added security for the driver, vehicle and load, and peace of mind for our customers.